Has anyone here ever painted their bumpers or trim? It's not something I've really ever thoguht about until I came across a picture of a custom 58 Chrysler with part of the front bumper painted to match the car. On this car, I think it looks fantastic. They didn't over do it by painting the whole bumper, and it really does a good job emphasizing the grille and wing-like top part of the bumper. Location: Lower Mainland BC 58 Canadian Windsor? Looks okay but why hide the chrome? Location: NorCal I lost my taste for chrome long ago so I usually like painted-over chrome but the operative word is "usually". Location: So. California That would look funny with the chrome dagmars installed on it. Location: northern germany We love 50s cars because they follow a certain aesthetic, unique to the 50s. These cars are so pretty and so different from the all painted plactic blobs on the road today. Chrome is a major part of the difference. If there is a single material that stands for, or symbolizes, mid century cars, or the decade, it is CHROME. Chrome bumpers are a must for these cars. Sure tastes are different. Some people might say a lighted led frame around the Mona Lisa painting looks great... I say, style and taste can't be teached or described, you got it, or you don't. Arguing about tastes is always fruit and senseless. Location: Netherlands During the early years of me getting into cars I always wondered why someone would paint chrome bumpers. I found out more than often it was simply based on cheapness of the owner, not wanting to fix the chrome properly, and just slap some cheap on it. Ever since I got aware of that, my dislike for painted chrome grew every time I saw a '50s/'60s) car with it. A few year when I bought my '57 Chrysler, it had painted chrome everywhere! But because I had just lucked out on a previous '57, I still decided to get this one. A few of the first things I did was getting rid of all the hideious paint on the (unfortunatly mostly ruined by the paintshop) chrome. Location: So. California How did the paintshop ruin the chrome? How did the paintshop ruin the chrome? my guess is sanding or blasting I'd rather drive with faded, worn original chrome (patina) than with paint on ot. It just looks cheap and not right on these cars. New cars have painted bumpers, not 50s cars. Location: Netherlands Yes, with sanding and roughing up the chrome so the primer would stick. I must say, they did a 'good' job unfortunatly. I got another pair of bumpers through Big M as mine were toast. Although, these days I would've been more inclined to chrome wrap the bumpers instead. Location: DFW, TX For a custom look, there are a few cars that can get away with painted chrome. Very few. darned few. Apparently a '58 Windsor is one of them, because that looks good. Sometimes "body color" isn't the best idea for the painted parts. It can be done with argent or black to make those areas a bit more subtle. No matter how you do it, painting chrome can be risky. It usually comes across as a cheap and lazy fix for bad old chrome. But when the surrounding chrome looks as good as it does on that Chrysler, it is obviously done with intent. painted chrome usually just points out the cheapskate behind the car build. only raise so high is something of an exercise in futility. It didn't come painted. design perspective, this isn't too bad, and face it, .... it could be a LOT worse ! Location: Southern Sweden - Sturkö island The name of that Chevy must surely be "The Blob"
Location: Branson, MO I'm more into originality than custom stuff but I will admit that to me the bumper treatment on that '58 Chrysler doesn't look too bad - I've seen worse. They might have done the same with the rear bumper but it isn't shown. Now if they would do the same with that heavy chrome eyebrow, that would even be better. Powerflite - 2018-11-14 3:06 PM How did the paintshop ruin the chrome? my guess is sanding or blasting :wince: I'd rather drive with faded, worn original chrome (patina) than with paint on ot. It just looks cheap and not right on these cars. New cars have painted bumpers, not 50s cars. 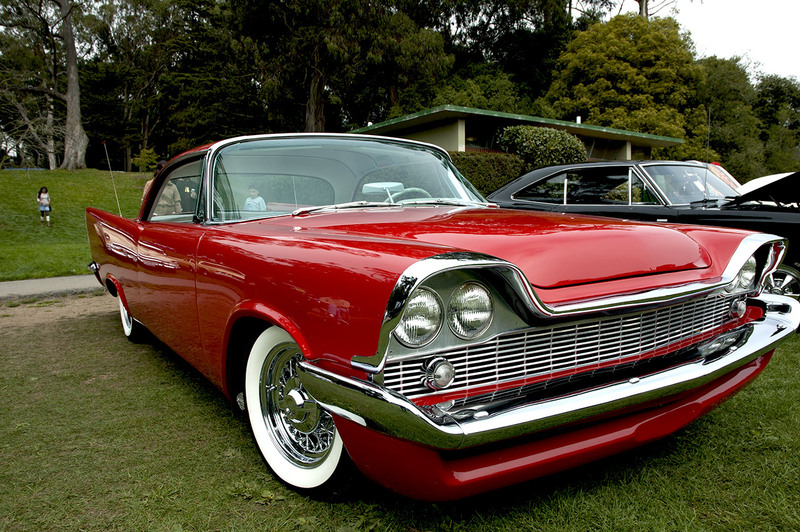 You're right, but there is one exception: the 58 Packard. The painted lower bumper on them really highlights the thin chrome bumper and dagmars. In fact, that's probably why I like that 58 Windsor with the bottom of the bumper painted, it's very reminicent of the 58 Packard's front bumper. My only complaint with the Packard's styling is the headlight treatment. Instead of reworkng and widening the single headlight fenders from the 57 to fit two lights, they just tacked on an attachment and called it good. Not a big issue in my opinion though, the fins on top of the fins makes up for it. To chrome or not to chrome is that the question? Personally I hate painted chrome, period. True chrome is the color it is parked over and nice shinny bright work can blind on comers on the road. However with the rise in today's resto-mods it is becoming more than common. Painting the stainless steel I think is a flat out crime. Yes it can cost a fortune to have things re-perttied and bright. What makes me wonder is if the 'items" were painted were they bent and smashed to start with. The labor in removing the years of abuse is not any different than that of having an interior re-done, the body smoothed over and the vroom and giddy uo made new again. Where do you cut cost's? Another common thing to do is simply leave the bright work off and re-invent, aka resto-mod. Again I like the bright work because it sets the cars off and different. When I had the grill, bumper stuff, the back ends it was far from cheap. But then my '56 Imperial would not turn heads without it. Location: northern germany If only the lower part of the bumper, which could be a sheet metal valance, is painted like the 58 in the OP, I could live with that, but the bumpers have to stay chrome. That 57 Chevy looks terrible. I hate resto-mods. I'm more into originality than custom stuff but I will admit that to me the bumper treatment on that '58 Chrysler doesn't look too bad - I've seen worse. They might have done the same with the rear bumper but it isn't shown. The rear bumper is also painted. It has '57 tail lights, too. Location: So. California I think the idea of painting that lower bumper is pretty good. But I would have painted it silver instead. That would give it a nice contrast without affecting the overall look - kind of like the '59 Plymouth front end. 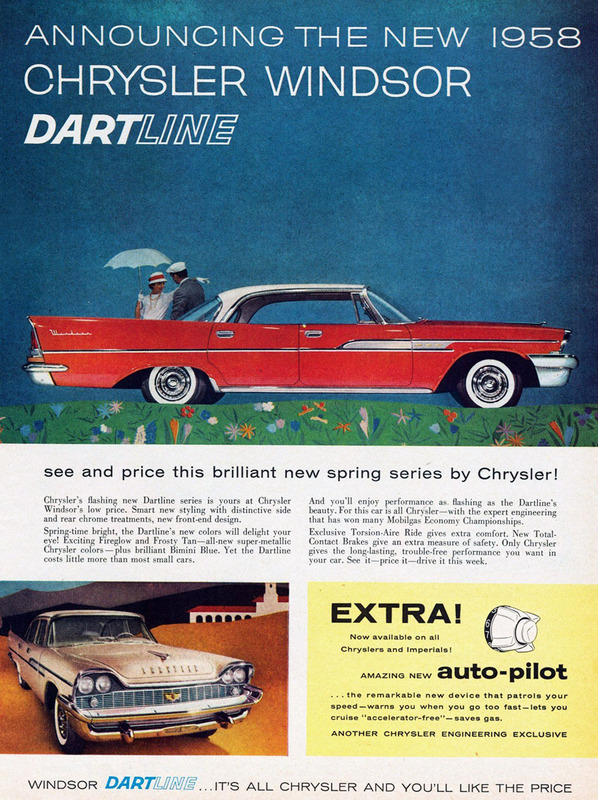 The filler panel between the bumper and body on the Chrysler is painted silver on the Windsor & Saratoga, but is chrome on the New Yorker & 300. In my opinion, the silver version on the lower end cars looks much better than the chrome there. With chrome, there is just too much of it around to appreciate it. The silver, on the other hand, gives a really nice contrast there. of the bezel remains 58. Location: So. California You're right. Good eye. The top of the lens can't be held in very tightly unless he did some mods to it. The real problem was not the headlights, but the lack of cash. Studebaker-Packard had been losing money since 1954 with the company having to write-off Packard assets such as the Detroit assembly plant and all parts and tooling for the Packard then in production. Production dropped from 85,252 (Studebaker) and 27,593 (Packard) in 1954 to 67,394 (Studebaker) and 5,495 (Packard) in 1957. S-P management knew quad headlamps would be all the rage for 1958 but they had no money to modify the front fenders. So, the pods were developed instead. 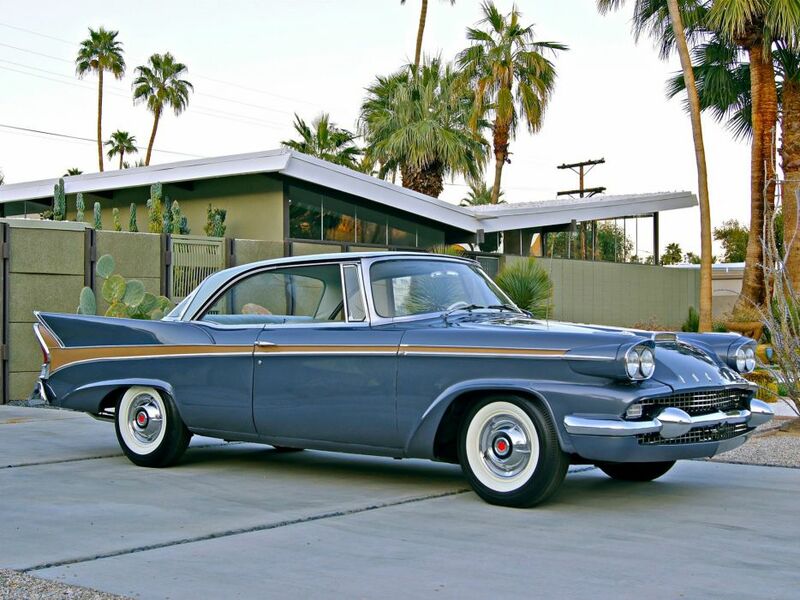 S-P was working on a new compact for 1959 and all their money was being used on the new Lark. 1958 production bombed (55,124 Studebakers and 1,745 Packards), but they made money in 1959 with the new Lark (153,823). Often thought they could have gone to a vertical layout to get rid of the pod, but then Studebaker would have had to spend money on modifying the grilles and bumpers on the Studebakers. The fins were rivetted onto the body, thus all the trim around the fins - hide the rivets. I'd drive these wheels off of any of these cars pictured. I think it's an art form - to figure out how to modify these cars; even down to what chrome stays and what chrome goes - and still make it look good. I plan on "de-chroming" bits of my Coronet to blend that idea between the old and the new. I hope I can be as successful in finding that tasteful middle ground as these owners have. ViperMan - 2018-11-28 9:54 AM I'd drive these wheels off of any of these cars pictured. I think it's an art form - to figure out how to modify these cars; even down to what chrome stays and what chrome goes - and still make it look good. I plan on "de-chroming" bits of my Coronet to blend that idea between the old and the new. I hope I can be as successful in finding that tasteful middle ground as these owners have. I'd see if you could find someone who's good with Photoshop to help you out, that way you can see what it will look like before you paint the parts. Something that you think will look good in your head might not look so good once you actually see it for real. I'd hate to paint a part only to realize it doesn't look quite as good as you imagined and then shell out money on new parts or rechroming to reverse it.